Escibe and Device Monitor always seem to want to always open in Full Screen Mode and I find this really, really annoying. Any other Windows programs I have with exception of a few cad programs I tried will open with the last sized window view I was using it in. Is there any way one can customize escribe to set it up to remember what screen view settings were the last time the program was open and have it open the same size next time? Is there something in options ot tools I am missing? I'm also curious if the device monitor could remain open while I edit settings in escribe instead of having to close it before changing & uploading a setting only to have to open it again and then resize the window twice to see the effects of the changes I made on the device monitor graph in a window size I can keep open on the right of my screen While I work on other projects on the left of my screen. Thanks for the quick reply. I had my escribe box checked to automatically check for updates and got no prompt of such an update. it started to download, the little box flashed, screen went dark on V200 & got error message that no device was connected on repeated tries. 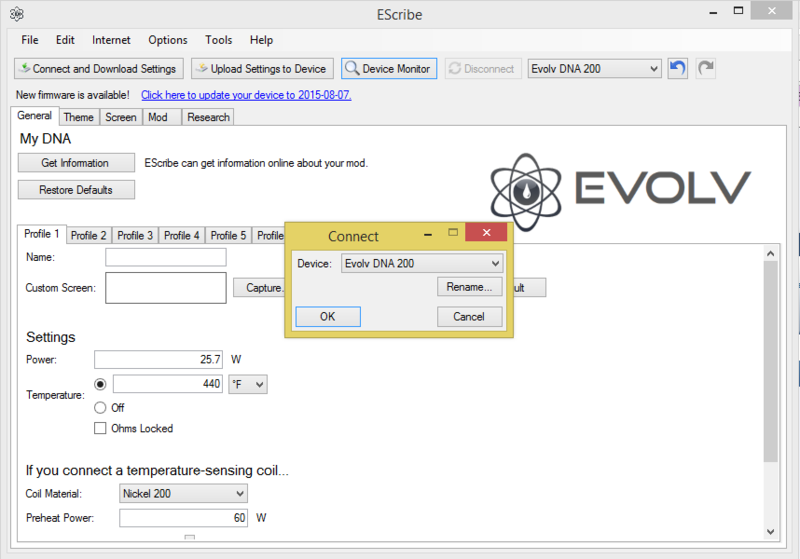 Pressing fire button on device reboots device and escribe can see it if I connect through device monitor & appears to work. Pulled cable & reloaded https://www.dimensionengineering.com/software/SetupES_2015-08-07.exe completely same thing happens when I try to update firmware, even when I try to roll it back to 2015-07-16.sw-update. Rebooted Win8.1 computer & uninstalled escribe completely reinstalling program...no change. Tried installing same update on win7 machine. Same thing. Cannot update firmware at all on HanaV200 due to unit shutting down during firmware update. only access unit after hitting fire button to reboot. Think I screwed up the Hana? Hmmm...sounds like your trying to reload the firmware the right way.....have u ever updated firmware before? Have u tried a different cable? Updated firmware from 2015-06-26.sw-update it came with to 2015-07-16.sw-update right after I got the unit w/ no problems. Just pulled escribe from win7 machine & rebooted w/ intention to go back to stable release escibe & load it but that is release I had on win7machine when I first rebooted the win 8.1 machine & had communication issues there too. Cable is one that came with hana & have been using without issue since I got it. Just tried to roll back to 2015-07-16.sw-update on the clean install of stable release & same issue exists. All my computers have been set up to run VLC on a HDTV as a second monitor, however neither was connected when problem occurred. As I said the firmware up load shuts down mod and no communication occurs. When I close the error box and press fire button, the mod lights up and Evolve will display the connect box restoring communication. Not sure reboot was proper term to make you understand what I am saying but it was the term I used, probably in error. Sorry for my stupidity. It will then download settings and allow Device Monitor to be started. My problem is not with the window not sizing properly in the 8/7 update. t is with the firmware updates not uploading to the mod as described in the early firmware section.